I love a lazy Sunday. Tinker around in the kitchen, lay on the couch, blog, blog, read blogs, take pictures of your food that you created while tinkering. You get the picture. Breakfast was outstanding (even though I wasn't finished with it until 11:00)! Then came Sunday night dinner. I have had this one of the menu all week and I decided that it would make a good Sunday night dinner. I made mine in my rotisserie but you can also grill it. If you are grilling it, preheat your grill to medium-high. Brush grate with oil. Combine honey, chipotle chili powder, salt, and lime juice in a large resealable plastic bag. Add tenderloin to bag and marinate 10-15 minutes. If you are preparing this in your rotisserie, just spear the tenderloins on to the spears and pop in your rotisserie for about an hour or until the internal temperature is 150. If you are grilling - grill pork, covered, flipping and basting with marinade until cooked to an internal temperature of 150, 15-20 minutes. Remove pork from grill, tent with foil, and let rest 10 minutes before slicing into 1 1/2-inch thick pieces. Boil potatoes in water, 12 minutes. Add beans, cook 3 minutes; drain. Whisk together mayonnaise, yogurt, tarragon, scallions, Dijon, lemon juice, salt, and pepper for the dressing; add cucumber. Toss dressing with potatoes, beans and eggs. Serve warm or cold. Feel free to add 2 hard boiled eggs to this dish. The original recipe called for it but I didn't see that until it was too late. Also, if you would like to add 2 minced scallions to the dressing, go for it! I also made Garlic Knots because they are so out of this freaking world savory! 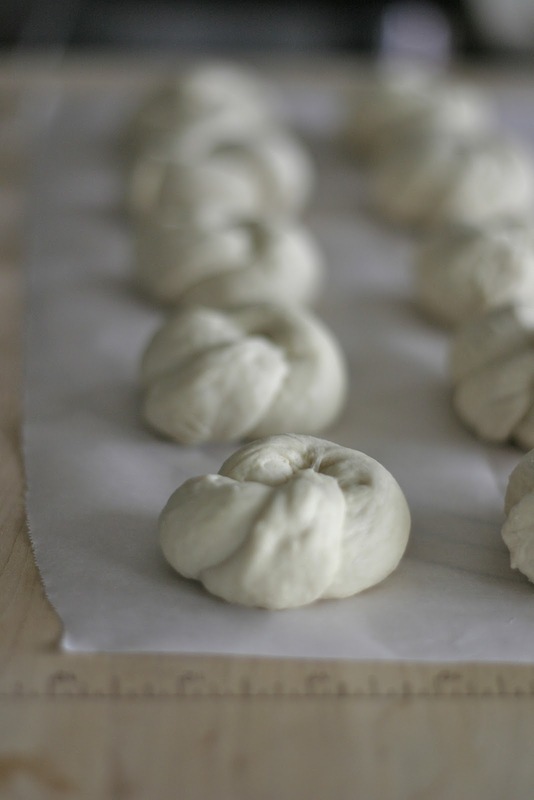 I had left-over Artisan Bread dough and decided to tie some up into knots, let them rest for about 40 minutes. Melt some butter and add minced garlic, stir it up, brush it on to your knots, sprinkle with dried rosemary and freshly grated Parmesan cheese. Pop in the oven for about 30 minutes on 350. I love the marinade you used on the pork. Sounds like a fabulous Sunday dinner! What a lovely and healthy dinner! When I get tarragon, I'm going to make this salad - looks great! This dishes makes my mouth watery and my stomach hungry for food! It all looks so delicious! Love the healthy twist on potato salad. Thanks everyone! The marinade was awesome, it made the pork sticky and heavenly :) It was a flavorful low calorie meal. That is one outstanding Sunday dinner. I love every morsel of it, but I especially like the cucumber dressing and the green beans in the salad.